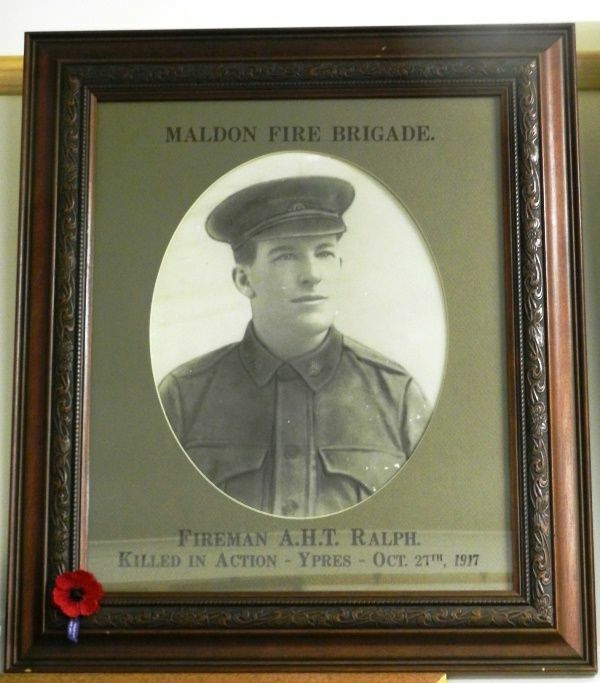 A framed photograph commemorates Private Arnold Ralph, a member of the Maldon Fire Brigade who was killed in a ction during World War One. On Monday, an enlarged photograph of Private Arnold Ralph, son of Mr and Mrs R. Ralph, of Maldon, which is to hang in the rooms of the local Fire Brigade, of which deceased was once a member, was unveiled by Cr. J. Bowen (shire president), who with Deputy Chief-Officer Turner. Captain T. Huish, and Cr. W. E. Preece, gave short addresses. Deceased was one of Maldon's finest footballers. Castlemaine Mail (Vic), 15 August 1918. FIREMAN A. H. T. RALPH.